Nvidia, which is betting its future in gaming on the Android OS, has dropped the price of its Shield portable gaming console to US$299. The handheld device will start shipping on June 27. The gaming console was originally priced at $349, which was considered high when compared to Sony's PS Vita, which is available for $249.99 on some online stores. The price was also just $50 lower than Sony's upcoming PlayStation 4 gaming console, which will start shipping late this year. But with a price under $300, the gaming console may now appeal to a wider audience. The Shield has superior hardware compared to the PS Vita, and the number of games available for Android is expanding. Nvidia initially had been conservative with its projections on Shield, targeting it mainly at enthusiast gamers and users of the company's GeForce graphics cards. "We've heard from thousands of gamers that if the price was $299, we'd have a home run," wrote Nvidia's Jason Paul in a blog entry on the company's website. Those who have already ordered Shield will be charged $299, Paul wrote. The Android gaming handheld has built-in controllers and a 5-inch flip-up screen that can display images at a 1280 by 720 pixel resolution. A mini-HDMI port can stream full 1920 x 1080-pixel images to TV sets. Games can be streamed wirelessly from PCs equipped with GeForce graphics cards. Other features include Wi-Fi, 16GB of storage and micro-SD for expandable storage. The device has the Tegra 4 processor, which has 72 graphics cores. It weighs 579 grams and offers five to six hours of game-play or up to 10 hours of video playback on a single battery charge. Shield can also function as a tablet. Nvidia has said around 40 to 60 game titles will be initially available for it. But mobile gaming is growing at a faster rate than console games, and Nvidia hopes to cash in on the trend. The company hopes future iterations of Shield will overtake console games like the PS4 and Xbox, which can be expensive to own when accounting for the price of the gaming titles. Android games are cheap, and the handheld can already provide a solid casual gaming experience on TV sets, the company has said. 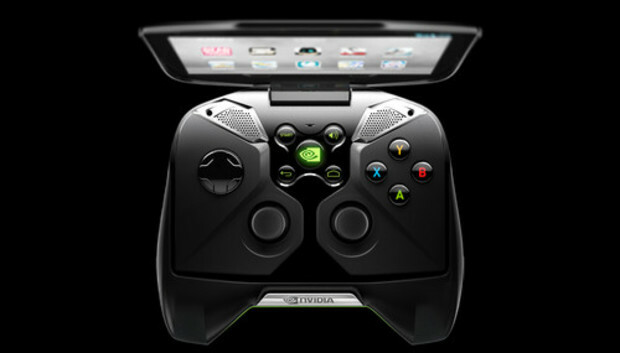 The handheld will also be a showcase for Nvidia's cloud gaming strategy. Nvidia hopes that ultimately the device will connect to remote servers equipped with Tesla graphics that stream games through the cloud. However, that ability has not been announced yet.